BREEZY POINT — Frustrated residents still recovering from Hurricane Sandy railed against the city's Build It Back program, along with other city agencies and decisions made after the storm, at a town hall sponsored by the city comptroller Wednesday night. The meeting was an opportunity for homeowners to share with Comptroller Scott Stringer their issues with the federally-funded rebuilding program that's been criticized as slow and mismanaged and is now the subject of an audit. "When it comes to Sandy there's a lot to audit, because a lot has gone terribly wrong," Stringer said inside the Colony Theater in Breezy Point. The comptroller's office recently launched a Sandy oversight unit to take a critical look at some of the programs implemented after the storm. Homeowners lined up to share their tales of woe — some that the comptroller couldn't even believe, like when a man said his daughter is still paying a water bill on a Neponsit home that no longer exists. Another homeowner lifted a giant folder of papers and another bag filled with more files, saying "the only thing I haven't given is my death certificate" in the reimbursement process. "They'll be looking for that soon," Tom O'Keefe said. Brenda Peters, 61, has been displaced from her Far Rockaway home since it was flooded with two feet of water after the storm. She has to lift her home but is waiting on funds through Build It Back — which she hasn't seen yet. Since then she's been living with family and friends, she said, but is "on my last friend." "I need to get my house fixed and live a quiet and peaceful life," she said. "Where am I going to go after this? After this it's a shelter." The rebuilding program, which was implemented under former Mayor Michael Bloomberg, has been criticized by Mayor Bill de Blasio, who said in February that the city had to "do better" at releasing the funds. His administration released a report on April 17 detailing proposed changes, with a promise to start 500 construction projects by the end of the summer. As of this week, 20 construction projects have started across the city and the program has sent out 88 reimbursement checks to homeowners, according to the mayor's press office. "Obviously we were focused on Build It Back, but we're also pleased to hear that people could identify other issues as well, the whole issue of looking into the Parks Department, HPD, the art department," he said. "All of these agencies should be looked at because we obviously should do a better job of coordinating." Amy Peterson, who is in charge of the Housing Recovery Office which oversees the Build It Back program, said she and the agency continues to work through the problems. "What I heard today is what I've been hearing for the last month," she said. She pointed to the increased construction starts and checks, along with meetings with homeowners that should get more projects started. "It used to be a system of no, and now it's a system of 'how can we get you the funding you need,'" she said. 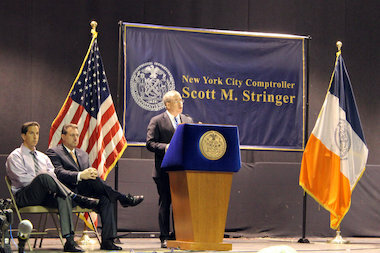 The comptroller's office is holding three more town halls for Sandy-impacted communities. ► May 6th, Coney Island Hospital, 2601 Ocean Parkway, Brooklyn, NY, 6 p.m. until 8 p.m.
► May 20, Mt. Carmel Baptist Church, 348 Beach 71st Street, Arverne, 6 p.m. until 8 p.m.
► May 28, Olympia Activity Center (OAC), 1126 Olympia Blvd., Staten Island, NY, 6 p.m. until 8 p.m.